A constructivist artist who worked mainly with collage and photography, Ella Bergmann-Michel (1895-1971) made some innovative documentaries between 1931 and 1933, which today provide a valuable account of the liberal climate in Frankfurt in the latter years of the Weimar Republic. She was a leading exponent of the Bund neues Frankfurt group [New Frankfurt Alliance], which brought together architects and artists intent on developing a practical and socially-oriented modernist project. 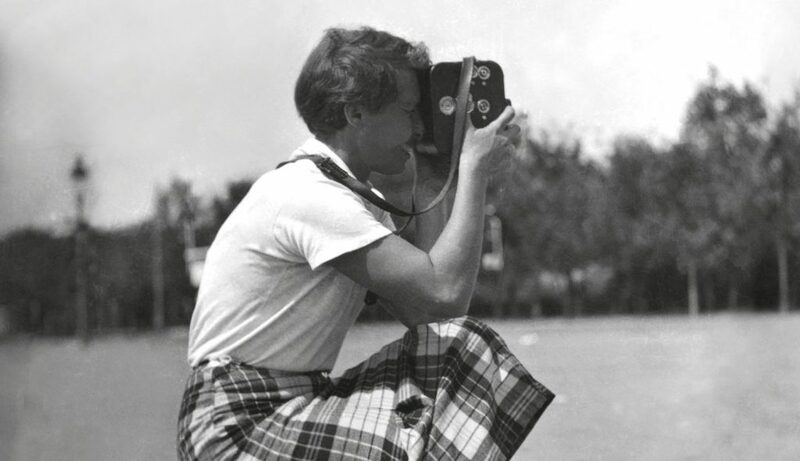 Bergmann-Michel was in charge of organizing film screenings, which was how she came into contact with Dziga Vertov and Joris Ivens, whose works strongly influenced her. Her circle of friends also included artists and intellectuals such as Kurt Schwitters, Asja Lācis, and László Moholy-Nagy. Bergmann-Michel used the camera – a Kinamo (Kin amo = I love cinema), developed as of 1922 by the engineer Emanuel Goldberg – filming quickly, with a documentary-narrative approach, focusing on the everyday social life she observed, both to promote the Neue Bauen, and to collect funds to support soup kitchens for the unemployed. She used short scenes of fiction to emphasize the point she was most interested in: the expansive structure of the architecture of a new home for the elderly, the disappointment on the face of a starving person who turns up at a soup kitchen which has no food supplies, or even the authorities’ hold over street vendors. The habit of filming what was happening before her eyes on the street attracted growing suspicion, which culminated in her arrest and her film being confiscated during the shooting of Letzte Wahl. Earlier footage was saved, which vividly documented the bitter political conflict during the last free elections in Germany in 1932. In 1933, when the regime banned her work, Bergmann-Michel was forced to retreat to the country with her husband. Paul Seligman, her fellow comrade and producer of some of her shorts (we’ll see him in a previously unseen 1976 interview), had to leave the country. After the war, Bergmann-Michel continued to put forward her ideas as organizer of a film society. At the end of the eighties, renewed interest in progressive documentary cinema led the Hamburg Academy of Fine Arts (where Ella’s son, Hans Michel, taught) to produce the portrait-documentary Mein Herz schlägt Blau – Ella Bergmann-Michel, following extensive research of dispersed material. Originally distributed in 16mm format, her films were restored between 2005 and 2006 by the Deutsches Filminstitut in Frankfurt. Our thanks go to Jutta Hercher, Karin Orchard, Gerhard Schumm (archive of the Sprengel Museum Hannover), Rudolf Worschech (Deutsches Filmmuseum – Deutsches Filminstitut) and Sünke Michel.